Neither Defence Minister Peter MacKay nor U. S. Defence Secretary Robert Gates were straightforward or candid in their statements regarding Friday's day-long meeting of defence ministers from the U.S., Britain, Holland, Australia, Estonia, Denmark and Romania. MacKay called upon NATO countries he considers slackers because they have placed caveats on their forces that prevent them from being deployed in combat areas to remove them. He knows their decisions are based on public opinion just as was his government's decision to be out of combat in 2011. Why would Germany, Italy and France alter their positions because of Obama when he says we won't? Gates must consider the media to be naive (another meaning of disingenuous) in saying "that despite the violence, coalition forces remain in control of the country." 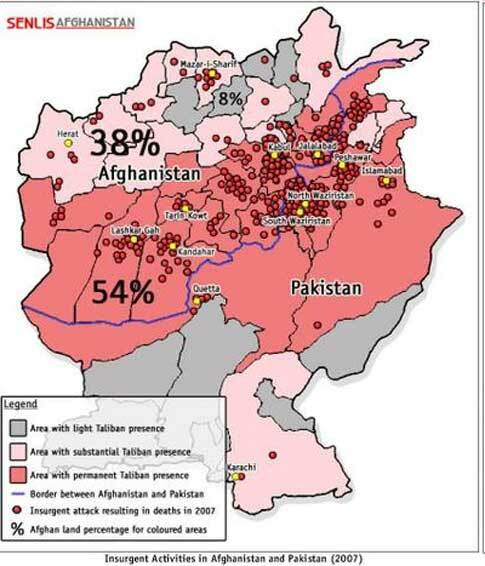 and that "the Taliban do not hold any land"..
A year ago the Senlis Council reported "Taliban in Control of 54 Percent of Afghanistan". Conditions have worsened since then when it was concluded that "The Taliban are the de facto governing authority in significant portions of territory in the south and east, and are starting to control parts of the local economy and key infrastructure such as roads and energy supply." An Aug. 6, 2008 (AP) article stated " Sometimes villagers go to the Taliban because their courts move faster and appear less corrupt, experts said. But at other times, in Taliban strongholds, people are afraid to turn anywhere else.". Gates is down playing Taliban strength because in his words "The most important objective for us for 2009 in Afghanistan is a successful election," Mr. Gates said. "One of the things we talked about his morning was trying to surge as many forces as we can prior to the election, to try and provide a secure environment for the election." "Many politicians and party leaders of the country are concerned by the fact that the instability in Afghanistan will negatively affect the election process.The experts say that holding elections in the country is impossible under the situation, when the security is not ensured, and serious measures are not undertaken with regards to the opposition, who speak against the power." The election is proceeding. Gates aim is it be seen as a being successful. Whether his "spin" that the Taliban is weaker than it is will be an assist is yet to be determined.